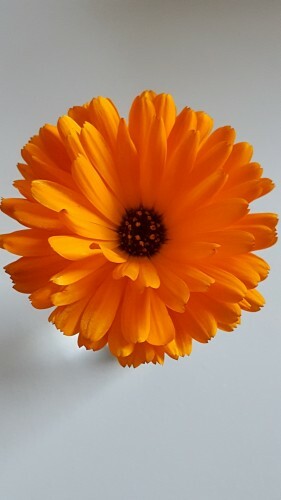 Direct sow calendula seeds outdoors where they are to grow from April to May. Choose a position in full sun on well drained soil which has been raked to a fine tilth. Sow seeds thinly, at a depth of 1cm (1/2") in drills spaced 30cm (12") apart and cover seed with its own depth of soil to exclude light. Water the ground regularly, especially during dry periods. Germination usually takes 5-10 days. When calendula seedlings are large enough to handle, thin them out to 30cm (12") apart. Sow end 2019. Hardiness: Half hardy: the plant will tolerate temperatures down to 0C or 32F. Soil conditions: Light to medium soil type. Shallow to moderate depth. Well drained. Low salinity. Medium to low fertility. Natural habitat: The original habitat is obscure but it is found as a garden escape on waste, cultivated and arable land and along roadsides. Interest and use: Cutting bed, culinary, medicinal, greenhouse, containers.